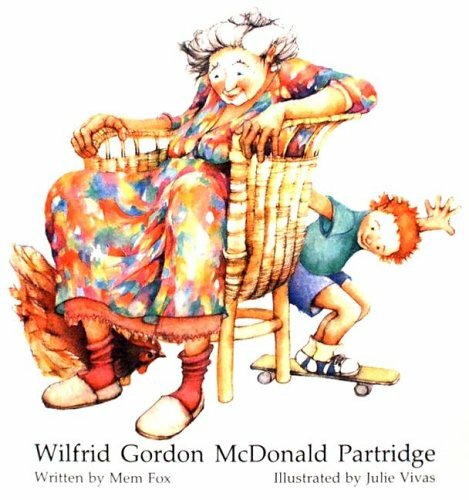 Wilfrid Gordon is a young boy who isn’t very old. He lives next to an old people’s home and knows everyone that lives there. His very favorite person is Miss Nancy, because she has 4 names just like him! One day he hears his parents talking about Miss Nancy. They are sad for her, because she can’t remember. Wilfrid Gordon doesn’t know what memory is and asks everyone to explain. From those explanations, he takes things that belongs to him to Miss Nancy. When Miss Nancy sees all of the objects, she starts to remember! This book is so cute. I can actually picture a little kid doing this for an older person. The author and illustrator both are from Australia, but I think this is very universal. The illustrations are great. Not too much detail, but enough to go along with the story. The pictures of each charcater makes the story that much better and a little bit funnier! This is truly a cute little book!